Aeolus4 is Comefri new selection program for centrifugal fans. It is a user friendly program that makes the calculation, selection, configuration of the correct fan easy. It allows the user to obtain a large quantity of catalog information, including fan curves, function fan ranges and application conditions. With Aeolus4 the customer can select a wide range of Comefri suitable centrifugal fans, including partial width options, in accordance with the technical input data. All data corresponds to internationally accepted standards, norms and fan laws.The print out (Data Sheet) includes all the data of the requested working point, the fan curves and the dimensional drawing (when available). Selfan is Comefri new selection program for axial fans. It allows selection of impellers for standard execution, vane-axial and counter-rotating. The fan can be chosen between the diameter/rpm options proposed by the software. 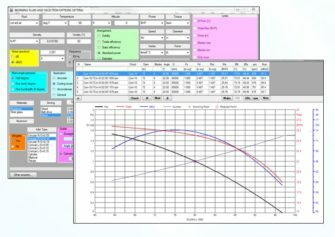 Technical data, working curves, torque curve, Campbell diagram and noise spectrum are available and can be printed for all the proposed options. BlackBox (32 bit) is the Comefri centrifugal fan calculation engine. It includes a dll library and XML data files. The aeobb32.dll is a library of functions (developed with Visual C++) written for programmers who want to make applications to calculate air handling units using COMEFRI range of fans. The DLL can be used from C, Visual Basic or other languages; The aeobb32.dll accesses to data stored in XML files. In order to use the aeobb32.dll you need Microsoft MsAdo version 2.6 or higher. Calculate fans for one fan family: the function finds out the most suitable fan according to the following request data entered: volume, pressure, temperature, altitude, density, pressure and outlet opening types. The function calculate: static and total performance, static and total pressure, operating point power, noise power. Aeolus4, Selfan, and BlackBox are freely available for clients. Download instructions for them can be requested on the “Downloads” page.